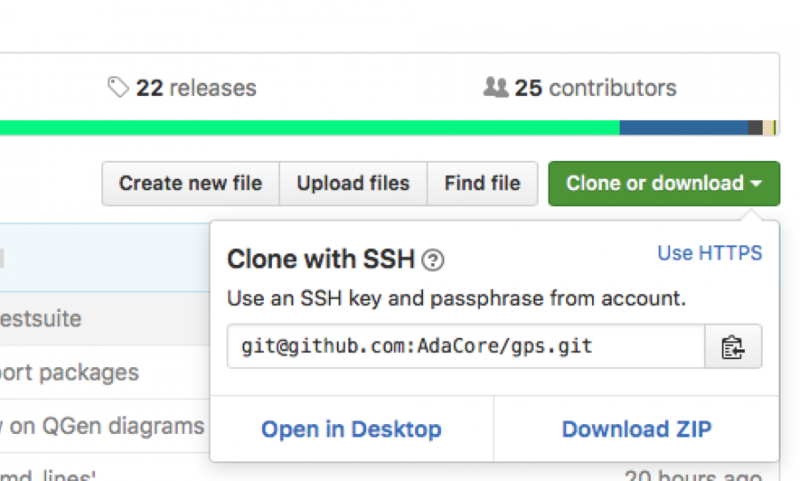 As we mentioned in an earlier post, AdaCore is busy making the source code for its tools available on GitHub. This is not a simple process. Some of the projects first had to be converted to git (from our historical use of subversion), and we needed to make sure that the tools can indeed be built with what is already available out there. We started with a few libraries and tools, like GtkAda and gprbuild. 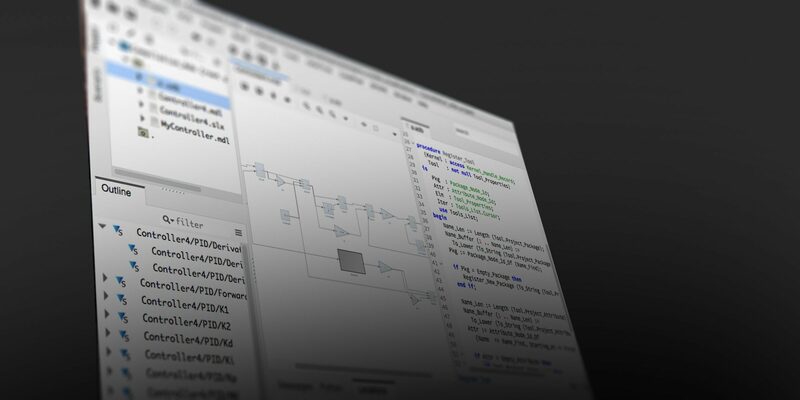 We have now managed to make the GNAT Programming Studio (also known as GPS) available. This is a large project that depends on a large number of libraries. to get the sources locally. Take a look at the INSTALL file for build instructions. Beware that you will need to first download and compile a number of other dependencies, like gprbuild, GtkAda and GnatColl. That most likely should not be the first project you try to compile. We have of course multiple reasons to make our sources available on a day to day basis. The most important is perhaps to help build communities around those tools. This is a great way to make sure they actually fulfill your expectations, and give you a chance to contribute ideas and code if you can. In the specific case of GPS, we believe we have a great Integrated Development Environment, which can be used in a large number of settings - whether you are developing a multi-million line project, or getting started with your first embedded software, or programming in other languages like C, C++ or Python. We also try to welcome people coming from other environments by taking a look at what exists and when possible, providing similar features. Such work can be done in GPS via the use of Python plugins, which have a great flexibility nowadays. Take a look at the GPS documentation and the existing plugins for examples. Unfortunately, we can't do it all and you might be able to help. We have been talking for years of setting up a repository of useful plugins written by people outside of the main GPS developers. And we believe GitHub is a great step forward in that direction. Click on the Fork button at the top-right corner. A window will pop up that lets you specify where to work. Select your account. 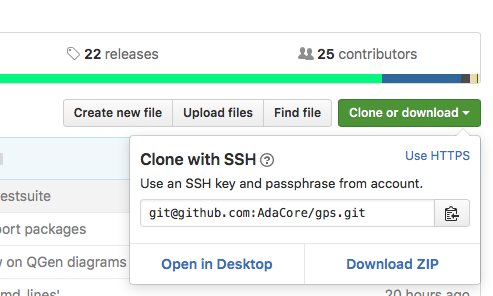 Github clones the repository to your own copy. You can now clone your new repository to your machine. Modify the sources or add new files with standard git commands, in particular "git add" and "git commit"
When you are ready, type "git push" to contribute your changes to your own repository on GitHub. To make things simpler in the case of trivial changes, steps 4, 5 and 6 can be done directly from the GitHub interface by editing files in place. You can now let us, the GPS developers, know that you have made the ultimate, ground breaking and fabulous change (or, if you prefer, that you have done a small minor fix). Click on the New Pull Request button. In the resulting dialog, you can leave most of the settings with their default value (which will basically try to merge your master branch into the official GPS master branch). When you press Create Pull Request, the GPS developers will receive a notification that a change is ready for adding to GPS. We will then do code reviews and comments on your patch and, I am sure, ultimately integrate it in the official GPS sources. At this stage, you have become a GPS contributor! See the GitHub documentation for more information. The goal is that after including your changes in GPS, they become part of GPS forever (both the GPL release available for free to everyone, as well as the Pro releases available to our customers). We will retain your names in the commit messages (after all, you did the work).